This has got to be one of the lightest, tastiest cakes I have ever tried. The picture was taken from a slice that was saved for someone to eat. I just could not resist clicking the pic and asking for the foolproof recipe. If any of you do make it, a better pic would be so appreciated. For all the celiacs out there, you will simply love this rich, moist cake. METHOD: Heat the oven to 150 deg. Mix the cream and mascarpone cheese, milk and vanilla and heat over a double boiler till heated well but not boiled. Cool thorougly. Sift the flour and add to the cooled cheese mixture. Add the egg yolks and mix well. Add the lime/lemon juice. Beat the eggwhites till stiff with the powdered sugar. Add this meringue to the cheese mixture and fold in carefully. Line a tin with wax paper and pir the mixture into it carefully. Place the tin into a bigger tin filled with water make sure the water does not overflow after placing the tin in it. Bake for an hour. Do not open the oven to check cake for an hour. After an hour check to see if an inserted toothpick comes out clean (it will). Cool the cake, slice and bite into a taste of heaven!!! 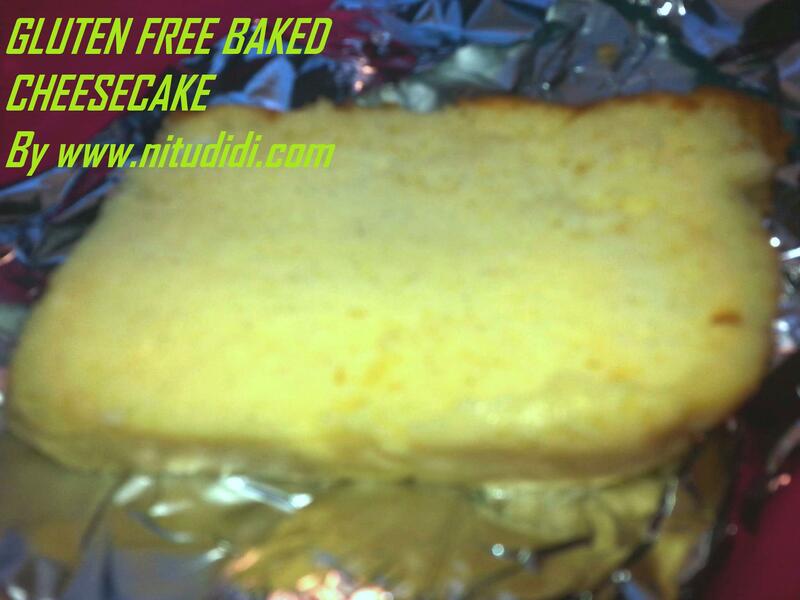 NITU DIDI TIP: You can flavour this cake with some orange essence instead of lemon. This cake tastes delicious when eaten cold, so cool in the refrigerator. Can be also served as a pudding, it is so light and moist. This entry was posted in A Piece of Cake?? ?, Crack an egg?? ?, Gluten Free, Magic Bullet and tagged celiac, cheesecake, creamcheese, glutenfree, riceflour. Bookmark the permalink.